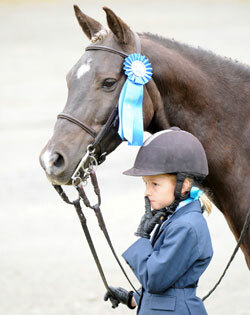 A show mom is a category of mom that all young riders know and love. 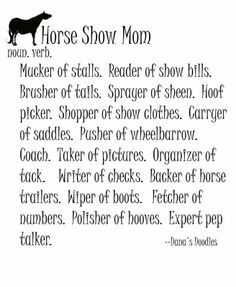 Show moms are the ones that come to their daughter’s horse shows, not just to watch, but to support and be a part of their child’s world. You don’t actually have to be a mom to be a show mom. For example, I’m not a mom, but I surely consider myself a show mom! They’re the mother figures that are there to help, keep everything in line and support the girls who are showing. 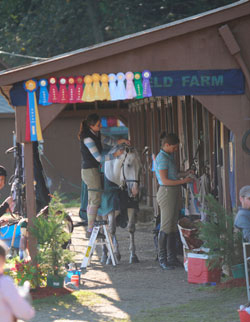 It’s usually 50/50 — some mom’s are naturally show moms (they think, why would I miss my daughter’s horse show? It’s her life! 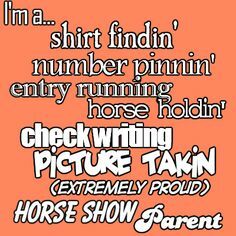 ), and some mom’s aren’t (they think, I really don’t want to spend a whole day or weekend at my daughters horse show… I have to [fill in the blank] and I can’t loose that much time). The best thing I can relate it to is the mothers of high school football players. Are you the kind of mom that will get in the car and drive 5 hours to an away game? Will you stand in the cold weather, dressed in your home team scarf, cheering them on? And then drive home to get back in the middle of the night? Or are you a home-game only kind of mom— you’re interested, and you’d like to watch, but only if it’s convenient. Either way, I can’t judge. Honestly, I get it. Being a show mom takes an immense amount of commitment to your daughter’s life rather than your own. It means that you will loose precious time just “hanging out” doing what your daughter likes to do. My mom was not a show mom, so I can see it from both sides. But I’d like to give you some insight as to what your daughter is really thinking, so that you can make an informed decision on how involved you’ll be. Why does your daughter want you to be a show mom? Deep down, every girl wants their mother to be genuinely interested and involved in their daily life. Yes, even when they’re pushing you away. They want to connect with you and they want you to understand them — the real them. For horse girls, so much of their personal life is spent at the barn. If you’re not there with them, you’re missing on a huge part of their life — who they are, how they interact with people and how they’re growing. I’ve always found that my barn friends are the closest to me because it feels like they know “the whole me”, who I truly am. Just like a non-horse friend that doesn’t really understand the whole them, do you want to get to know only one part of your daughter? The part when she’s at home in front of you? I know this is hard, and this is blunt, but this is the part where I look at it from your young daughter’s point of view. It’s an important side to see. When you’re not a part of her barn life, you’re missing out on an opportunity to be involved in her world. To know her better. To build a strong lasting bond and a friendship together. The best thing about this opportunity is that it doesn’t go away when your daughter hits puberty. Even if she wants you to be far away from her at all other times (I know, she’ll make this quite clear! ), your teenage daughter still wants you to be her show mom. You’ll never be uninvited from this opportunity. Take it. For purely practical purposes, your daughter needs help while she’s at a show. It’s tough to go it alone — that’s why professional riders hire grooms. It’s helpful to have a secondary person there to help them. If you decide that you’d like to give this “show mom” thing a go, here’s what you need to do to be prepared for the day. 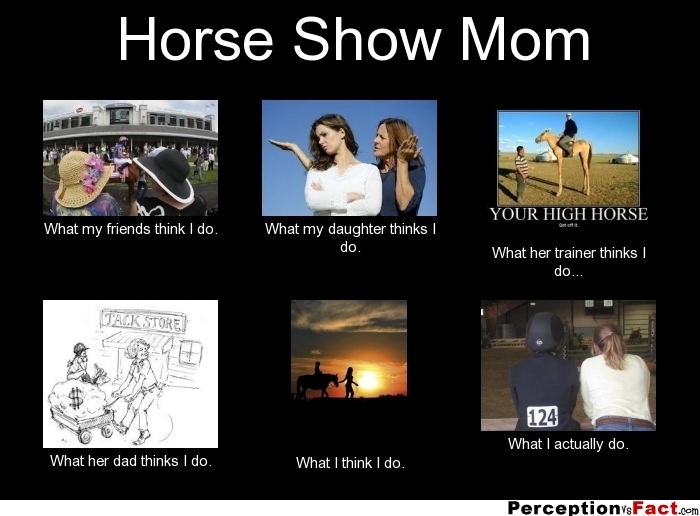 What’s involved with being a show mom? Every discipline of riding has a different type of show, so the day-to-day needs are all going to vary. But here’s the general line of what you can do to help her out, no matter what type of show you’re at. Ah, towels, the magic of the horse world. There never seems to be one when you need it. Remember to pack towels for wiping off her boots and saddle before she goes in to her test, or for wiping down a dusty (or grass-slobbered) horse. Be at the barn the night before to help pack up the trailer. Packing for a horse show can be a big project, especially if it’s not your trailer and you have to bring everything in and out every single time. She’s got a list that she has to remember to pack, along with bathing her horse, braiding (sometimes) and riding that day. 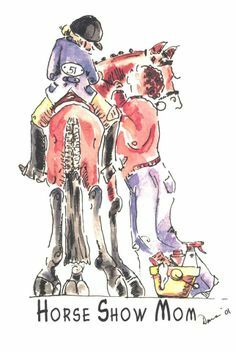 The prep for horse shows can almost take as much time as the show itself, so it’s always helpful to have an extra pair of helping hands if you have time the night before. When you arrive, help her find her number and time when she should ride. When you arrive, she’ll need to check in and get her bearings. You’ll want to help her find her number (it usually goes on her saddle pad when she rides), and figure out about what time she’s riding. You’ll want to keep an eye on the time to help her figure out when she needs to tack up, when to be done with her warm up, and adjust that time if the classes are running slow or fast that day. Bring good lunch. Make it a special occasion. My personal favorite was packing Maine Italian Amato’s sandwiches in the morning that we would open up later. Find out what she wants, and make it a special treat. It doesn’t have to be expensive, but it should make her smile looking back on it. If it’s a weekend show, make sure you’ve done some grocery shopping in advance for snacks to share with the group. Help groom and make sure that she has all of her tack in line. This is where you become a second hand to your daughter. She can groom, she can tack up, we already know this. But at a stressful time, you’re helping her by being her “right hand woman”. Just ask her what needs to be done, and you’ll get the hang of it after a few shows. Watch her horse while she changes. Again, you’re just being a helpful set of hands here. There’s a moment in time where your daughter is tacked up, and she has to change or finish getting herself ready before she can get on her horse. She’s halfway through both processes and may be running behind. The reason for this stressful moment is because if she’s showing in a class where you have to look “pretty” like dressage with white pants or western pleasure, she’s going to want to change after she tacks up so that she doesn’t get dirty. Instead of having her feel stressed with leaving her horse to change, you can watch her horse for her or help finish tacking up while she’s getting ready. Bring water for after her warm up. When you go watch her warm up for her class, pack some water along. This is one of the simplest moments where every girl wishes her show mom was there. If you’re by yourself, there’s no good place to put water down. Plus you have to get on and off your horse to get a drink. She may not think she’s thirsty, but she will be. Shows are often hot, and warm up rings are often dusty. After she warms up, she may need to kill time for 10-20 minutes before it’s time for her test. To allow her to show at peak performance, give her some water while she’s out there riding. So simple, but this one is a big deal. Don’t grab something from the trailer or go to the bathroom and miss it. This is her proud moment to shine. Be there for her by watching it. Hang out with her after her test. Be her buddy. This is where you really win. For all of your help, you get in return 1-5 hours (or more, if it’s a weekend show) to just hang out with your girl. Talk. Spend real time together. How often do you get that opportunity with your teenage daughter at home? This is really special time for both of you. It’s unplanned and not rushed. Bring some chairs to camp out by the trailer or watch the other girls in your group ride. Just make sure that she’s untacked and her horse is comfortable and fed/watered first. Make friends with the other moms. There’s lots of other mom’s that are in the same situation as you — get to know them and make some new friends. Maybe the barn will become a place where you like to spend time with your daughter and your friends! Whether you really want to be at the show or not, it’s always funner to have a community. If your committing your time to doing this for your daughter, do yourself a favor and make friends with the people around you. All these things, your daughter is capable of doing. We both know that. But you’re not actually doing her any favors by making her go it alone and be independent. Choose to be a part of her life, and help her with whatever she needs at her shows. You’ll find a fun community in the process, and build a long-lasting friendship with your daughter for years to come. One of my goals for the year of 2015 was to ride more. Actually, I know goals are supposed to be specific, so I put it like this: “Ride 2-3 times per week, because it makes me happy and grounded”. Happy and grounded? Interesting way of putting it. Of all the things that I could have focused on as the reason behind why I should be riding (moving around, getting exercise, taking care of a horse who needs to be ridden, just to name a few), doing something that makes me happy and grounded was what was the most important to me. To put it another way, my goal was: “ride more, because it keeps me emotionally healthy“. Physical health is a great thing that we get from riding. But in my opinion, the emotional health that we gain is far more important– and harder to get from other types of exercise. We can hike, we can go to a workout class, we can go for a run. Those things all keep us physically healthy, right? But horses… they give you something much more impactful. They give you peace. They give you emotional health. Let me ask you a question. What do you feel like when you leave the barn? Next time you’re there, I want you to take notice of this feeling. “… Aaahhhh.” A big sigh. And then some deep breaths. And then everything is quiet. And my mind is finally still. Being with horses is like a big sigh of relief. Like a weight has come off my shoulders, and I feel like I can breathe again. It’s funny, whenever I pull up at the barn, I don’t feel bad. I don’t feel like I can’t breathe. But I always notice a positive difference when I leave, in comparison to before. Dan Fries of The Jodpurs Company recently emailed me with the infographic below, and I found it so true. It’s all about how horses make us healthier, and interestingly enough, much of the health relates to emotional health — not physical. Horses allow us to be a part of something — we’re a vital half of a partnership. A partnership where you both learn and grow, and you’re in it together. This feeling, the feeling of being “in it together” is what Simon Sinek says is a result of a release of oxytocin in your brain. This chemical is actually what creates intimacy and trust between two beings, working together towards one end goal. It’s the feeling that someone will protect you. PS- you can read more about this in his (spectacular) book Leaders Eat Last. Riding reduces your stress hormones, so says a Washington State University research study. They tested and compared the stress hormones of 2 groups of children: one group worked with horses just an hour and a half each week, and one group did not. The group that worked with horses had significantly lower levels of stress hormones. Lower stress levels help prevent weight gain, and can ward of future mental health issues. Guess what this moment is? It’s a rider’s high, just like a runner’s high. The feeling of being able to go on forever, because you’re enjoying it so much. In your brain’s world, it’s actually a release of endorphins and seratonin, the same “happy” chemical your brain gets when it does any sort of exercise. The strength you get from riding has always been somewhat interesting to me– it’s different strength that you might get from lifting weights, because instead of building muscle by moving heavy things, you’re building muscle by trying to stay as still and relaxed as possible. Completely opposite. When you are pushed 1/4″ to the right of your center of gravity, your leg and core muscles have to immediately tense in a few different tiny spots to pull yourself back into balance, and then you have to relax. At the same time, you’ve already been pushed 1″ forward during the stride, and your body is keeping you still in the saddle. It’s this dynamic motion of tiny muscles constantly tensing and relaxing. This constant web of muscle interaction is what keeps great riders looking completely still and utterly quiet even when the horse has huge movements underneath them. I’ve said this one before, and I’ll say it again. Horses make us feel good. They make us feel good about ourselves and our life. They make us realize that we can take on the world. We’re responsible to keep them happy and healthy, and when you succeed in that, it feels good. Plus, your little girls (and boys) are controlling an animal that is 10x their size. It’s all very empowering. When 7 out of 10 girls don’t think they measure up to other girls their age (we’ll address this issue another time, because it surely is an issue), any boost in healthy self esteem is helpful and worthwhile. Equine therapy is a real thing, and is used to help with both physical and mental issues. 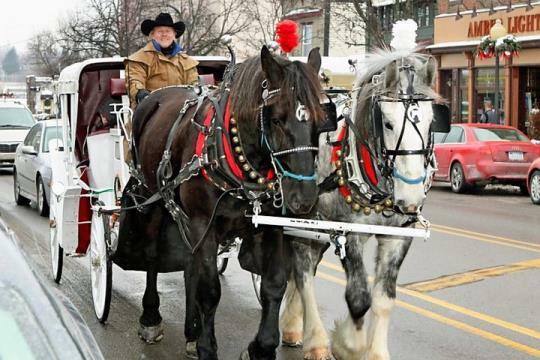 Just being around horses can help you achieve more emotional balance. But did you know that veterans often use equine therapy as a way to reduce PTSD, depression, anxiety, and other mental illnesses? Last but not least, of course there are physical health benefits! I love this example below, because it shows you how many calories you burn when you ride. No, it’s not as much as you might burn in an hour of running… But your riding time is not going to waste — you’re burning a lot of calories, so it’s not just exercise for the horse. You can count on burning about 400 calories per ride, when you do an average of 20 minutes of walking, 20 minutes of trotting and 20 minutes of cantering. 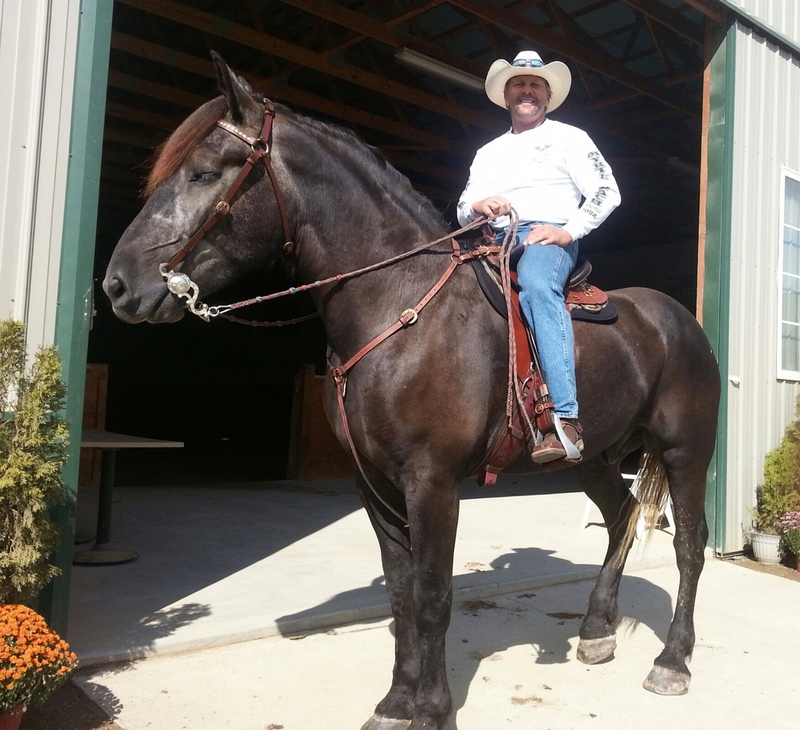 Tell me in the comments below, what do you think it is about horses that makes you a healthier person?